Odette Zero is a senior studying Anthropology and Global Health. She is interested in the intersection between medicine and culture in indigenous communities and individual experiences. She believes in the power of narrative to change the structural systems that maintain health inequalities and advocacy through impactful writing. Do you have an idea that can bring about social change? Have you already implemented a project that is doing that? The Clinton Global Initiatives University (CGIU) conference is an amazing opportunity that brings together global changemakers, topic experts, celebrities and 1,200 passionate university students from all over the world onto one college campus. 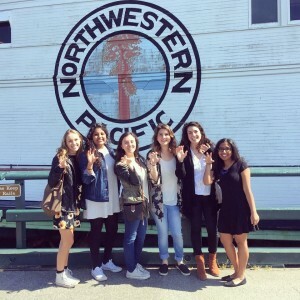 This year, IPD was able to send 6 global health minors to sunny Berkeley California, a charming college town a couple of minutes away from bustling San Francisco. Each student or group had to make a “Commitment to Action”, a project idea that they wish to implement at the campus, local or global level, targeted toward one of five focus areas: Education, Environment and Climate Change, Peace and Human Rights, Poverty Alleviation, or Public Health. The conference includes skill-building sections, topical and celebrity panels, funding opportu nities and many possibilities to network with other university students doing similar or different projects around the world. Of the 25 Northwestern students who attended the conference, Lakshmi Karuparthy’s commitment to action was to produce two films about malaria: one a documentary showcasing the hardships of an Indian village with malaria, and the other highlighting preventative measures and information about the disease in their native language. Another group commitment to action was the HIRCULES Health Hub, an initiative through the NU Community Health Corps to increase health literacy and improve accessibility to health information in our local community. HIRCULES (Health Information Resource Centers Utilizing Libraries in Evanston and Skokie) is staffed by Northwestern students trained in finding the resources community members need to answer their health-related questions using qualified medical databases, providing synthesized “action cards” and connecting people to local community organizations. The two co-founders and directors, Udita Persaud and myself, also applied for the Resolution Project, a social venture challenge that provides seed funding and extended mentorship for socially responsible leaders creating measurable impact around the world. After a rigorous application and pitching process, the HIRCULES Health Hub was recognized as one of 20 Social Venture Challenge Winners at the CGIU conference. When reflecting on this recognition, Udita told me “the HIRCULES Health Hub was just a mere idea two years ago, and now that people are actually interested in investing in it, it is such an amazing experience…it is rewarding to have others believe in something you have put endless time and care into.” We are both excited to see how the HIRCULES Health Hub continues to grow in the future. At the plenary sessions we received advice from global and local leaders on our commitments to action. The first was on the courage to create, where a NASA astronaut, an Egyptian political activist, and the founders of MuslimGirl.Net, Khan Academy and Pinterest talked about their road to success. It was reassuring to hear the narratives of fear and insecurity, overcoming obstacles, and taking the first step from such accomplished and successful people. Amani Al-Khatahtbeh, founder of MuslimGirl.net, told us to not shy away from our narratives of marginalization or struggle, as this is what makes us human. Former president Clinton, a budding anthropologist, told us that human beings at their core want to understand themselves and each other, to find meaning, and that these stories can connect us. This discussion was particularly salient for us university students, all in the development stages of projects that mean so much to us, but seem so far away from completion or success. The rest of the day consisted of skill sessions and topical panels on mental health, education in refugee camps, food insecurity and Ebola. Many global health classes talk about the chaos and lack of coordination after the earthquake in Haiti, and then again with the Ebola epidemic, as NGOs and international bodies flocked to the scene. Mohamed Barrie, co-founder of Wellbody Alliance, experienced this all to well with t he “crisis caravan” that arrived in Sierra Leone. He warned us of the danger of “pre-designed programs” for public health interventions that do not take into account the cultural norms of the community – a phenomenon that global health students also fall into after taking a few classes and thinking that they know how to “fix” the global south. Kassia Echavarri-Queen, a member of the Board of Directors for Doctors Without Borders, also discussed the need for community health knowledge when formulating treatment plans for “deeply cultural” diseases such as Ebola. In my opinion, every person involved in global health needs to view the world as an Anthropologist. While the cause of an infectious disease is vector-born, the root of the problem may be cultural. Only through active listening and observation can we hope to understand a problem in a different culture, and only with strong local participation can there ever be a sustainable solution. Governments, according to the Director of Development and External Relations for the Africa Governance Initiative, Dan Hymowitz, are the missing link in global health development and the first body that is ignored in times of crisis. 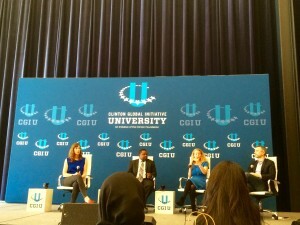 My experience at CGIU has revitalized my efforts and expanded my perspective toward my work on the HIRCULES Health Hub. I realized that I am one of many university students all around the world striving to create a better future, and that we do not have to wait until after graduation or far into the future to start bringing about change in our local and global communities.